The best healing retreat centre in Bali…? Not by chance. We’ve heard guests refer to our retreat centre often with these endearing names. And we’re always chuffed to receive the feedback, as we truly believe that one of the most fundamental parts of healing is the provision of a safe and supportive environment. And it is not something we’ve left to chance. So much deeper than a welcome drink or frangipani flower behind an ear… for our retreat team it is all about the union of West and East, honouring the ancient Balinese rituals, and keeping the retreat space clean and conducive to the detox and cleansing programs we offer. All in order to keep the energy “on point” for healing, cleansing and growth. Personally, it has been an insightful journey for my Western mind… it has meant the slow breakdown of my stoic preconceived notions of ‘business as usual’; ‘sticking to a plan’; and many of the other ‘sound’ business values learnt in the West. 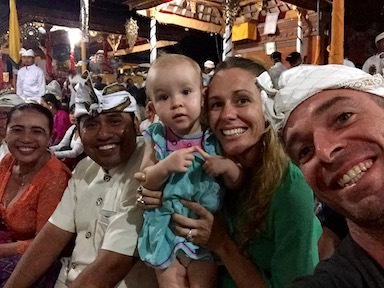 The journey has always been keeping the energy flowing… whether it is the flow between our culturally diverse team, the energy we spend to attract our ideal retreat guests, or simply the fusion of Balinese healing and Western medicine within our programs. It all contributes to the energy of the retreat centre – felt by anyone who happens to find themselves coming through the intricately carved wooden doors of the retreat centre and into the welcoming arms of our Ganesha statue… It is something our team commit to each and every day at our retreat centre in Ubud, Bali. Any day you might come across one of our retreat hosts wandering amidst a spiral of swirling smoke from a sage stick… only to turn the other way and witness one of our local Balinese knelt before Ganesha offering daily canang to the local Gods. And it has always been an inclusive experience for our clients, we’ve always their contribution to the energy of the retreat space is just as impactful as our own teams. Guests partake in a water blessing ceremony with a local High Priestess, and then our own private letter burning and cleansing ritual on site at the retreat centre. It all contributes to what we believe makes our retreat centre the greatest place for profound and transformational healing in Bali. Nothing by chance. Everything by choice. 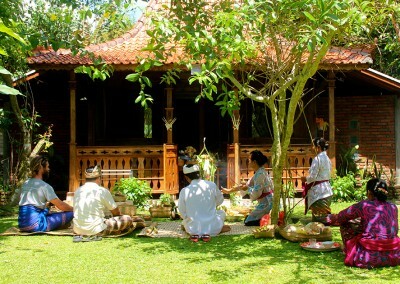 Our Balinese staff held a Mecaru ceremony at the retreat centre, which is also know as Butha Yadbya. It is a ritual to maintain the relationship between humans and the environment. The ceremony aims to give wisdom and spiritual values to people so that they will always maintain the harmony of nature, the environment and everything else. There is a lot of healing work that happens in our retreat bubble which makes this ceremony so special and valuable. We are continuing to honour and remember our surroundings, the nature and the spirits so that they can work together to help heal everyone who comes to visit. 💕🙏🏼 Thank you to our beautiful Balinese staff for holding this ceremony and especially to our own High Priestess, Dewi, for organising it 🔮 ❤️ So much love and gratitude for you all. Hi I’m Pat. I support and inspire others to become the best possible version of themselves, reaching for their full potential. At NIH I have the profound experience of witnessing amazing clients go deep into the inner realm of their psyches and emerge more connected, clear, and with so much more to offer the world and those around them. Our retreats are a trigger point for positive change, and while the physical detox is essential and will happen – the jewels for me is in the emotional baggage left behind and the mental clarity at the end of retreats.